The Maine Outdoorsman: Your 40 Years Old If . . .
40 Looks Good On Ya!!! 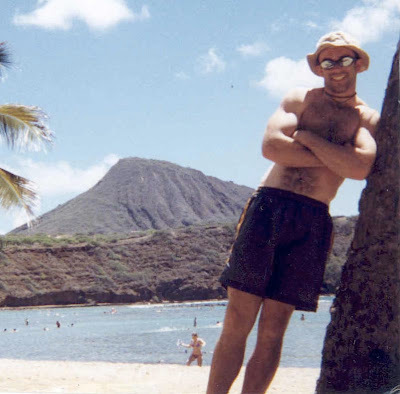 Ok I cannot lie, the picture above was taken when I was twenty something, totally in shape, touring the world (picture was taken in Hawaii) and full of crazy aspirations! How much has changed over the last 20 years. Now I "think" I am in shape, only tour Maine and am just crazy. LOL! To celebrate this monumental occasion I have created a list of "Your 40 Years Old If . . ." for the enjoyment of those of us in the prime of our lives! you think a blackberry is what you put on top of vanilla ice cream. you would much rather try and catch a striper than a stripper. your hair has finally finished its migration from your head to your back. your idea of a night out on the town ends at 9:00 PM rather than 9:00 AM. your idea of going out to eat is hitting the meat lovers breakfast at Dennys on Sunday morning. the pain from a pulled muscle lasts 6 months. you remember cartoons ONLY being on during Saturday mornings. you are VERY happy to have a doctor with small fingers. you are laughing right now from the above comment and not perplexed. bad gas occurs due to what you ate and not water in your fuel tank. attending a WILD party is you and a couple old fraternity brother sitting around drinking beer and reminiscing about the college days. you have ever eaten something and had it "not agree with you". you seem to appreciate sunrises and sunsets just a little bit more. your Friday night trip the liquor store has been replaced by Saturday morning trips to the hardware store. you believe the term "getting your gun off" actually refers to a firearm. the above phrase excites you more than the other more sexually oriented meaning. you have ever had to pluck or clip a nose hair. just thinking of a cup of coffee make you have to pee. you know the meaning of the term "manscaping". your favorite song, from the moldy oldies, comes on the radio and you crank it to 11 for about 30 seconds then you realize it hurts your ears and you wonder why anyone would ever be stupid enough to listen to music that loud. you know the name of the movie in which they "Cranked the amplifier to 11". you enjoy taking a kid fishing or hunting more fun than going yourself. I hope you enjoyed the list! Please drop a comment with any additions you would like to make to the list! I'm not quite there yet, but pretty darn close. I can relate to everything on this list! Happy 40th my man!! You had me think of another one. Your 40 if you idea of smoking the "strange stuff" is smoking salmon over PECAN chips. LOL! Almost forgot about the chips! I expect a review of the product for my bud!! CG, Thanks! Nice hearing from you! Hope you have been enjoying your summer with some great eats and lake side camping! As one who has crossed over, I can tell you I don't have any regrets. Happy Birthday and enjoy! Happy birthday, and great list. Keeping an optimistic attitude towards aging always helps to keep the mind (not necessarily body) young. Enjoy the celebration! "In ancient times, hundreds of years before the dawn of history, an ancient race of people... the Druids. No one knows who they were or what they were doing..."
Echo Trey's comment. Not quite there. The faster life moves, the more I seem to appreciate each day. JNS, Will be sure to heed your advice. ST, HAHAH you crack me up. "Why don't you just make 10 louder"! Ren, No worries I already have PLENTY of other pending excuses! I was at a shopping centre (Mall) when I saw a guy about my age with his very good looking and much younger GF walking towards me, as they passed i realised from their conversation, she's his daughter. But his knowledge of Maine is most valid. SB, HAHAHAHA! You know I have done the same thing! In all honesty I could easily have a 20 year old daughter! PBM, That is great! LOL!